Tip: Some of the files mentioned on this web page are not hosted at YLW, they are hosted at rapidshare.com. You can download them for free. What you have to do is the following: when you click on the icon and the new window opens first click on "Free" button on the first page. It will take you to the second page where you have to type in a code (just copy the number/letters combination which will pop up). After that save the file to your computer. That's all. Check out Bulletin Board for new links to the content that you may wish to download. This new version of the Chinese Visa application form was released in May of 2007. It has two pages as opposed to the previous version which was only one page long. You can just click on the link above and the file will open in your web browser; after that you can fill in all required information and print it. If you wish you can download the form and do the same thing off-line. I have created these flash cards for myself and I find them very useful. There are 15 flash cards altogether and you can print all of them or only those that you think you need. The format of the cards is 4” X 6” inches (or 10.1 x 15.2 cm) which is the standard format for index cards. The two icons above are links to the zip file which contains all 15 cards, and the second one is one sample index card, so you can take a look and decide if you like it or not. This zip file contains one blank itinerary template and two sample itineraries (the ones I made for my trips to China in 2005 and 2007). I suggest that you plan your trip using this or similar template because it will immensely improve your estimates on time and money required for the trip. Of course, you can later make all necessary adjustments but without going into detail chances are you will have to deal with too many surprises when you get to China. The second file is the html file with the notes I collected while preparing for the trip in 2007, I though you might find it useful too. You will certainly need one good map for your trip preparation. This map is something that you can use however more detailed maps (usually you can find them in the travel guide books) will be needed. With this map you can get general idea about the distances and locations of the big Chinese cities, regions and provinces. This file is hosted at rapidshare.com. Password for the zip file is 123. 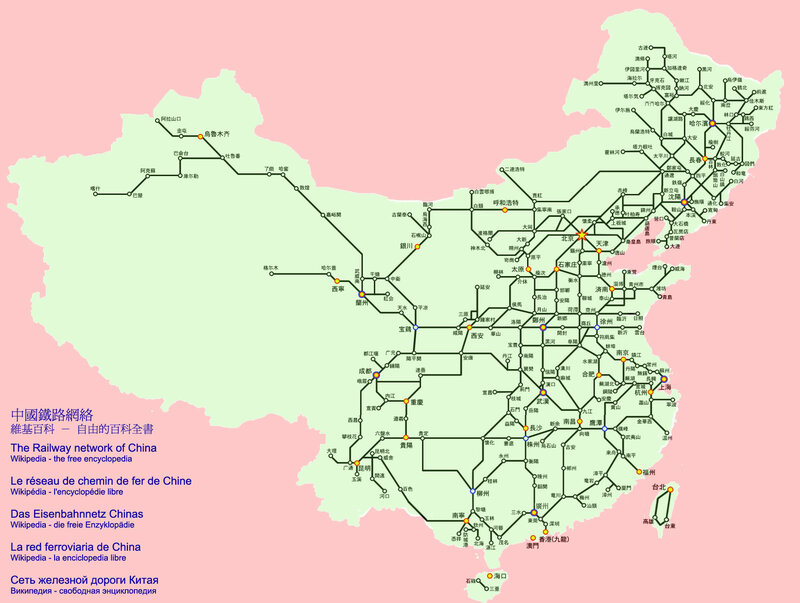 Here you have the Railway Network of China which is in Chinese but I’m sure it can be helpful when you plan your trip because in all guide books the names of the cities are written in English, pinyin and Chinese characters. 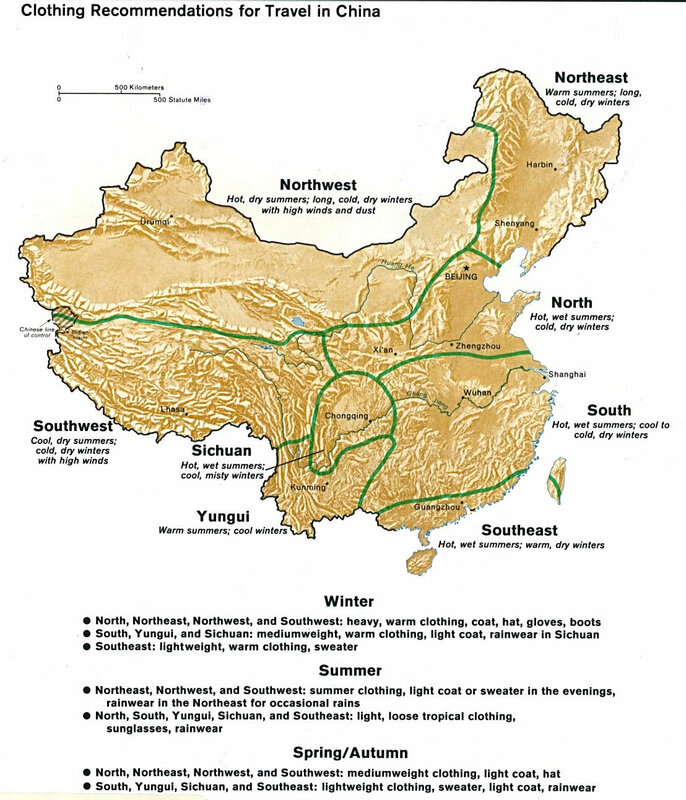 On this map you can see what type of clothing is recommended when you travel to different parts of China. The climate in the south is much milder than the climate in the northern provinces so you should dress accordingly. 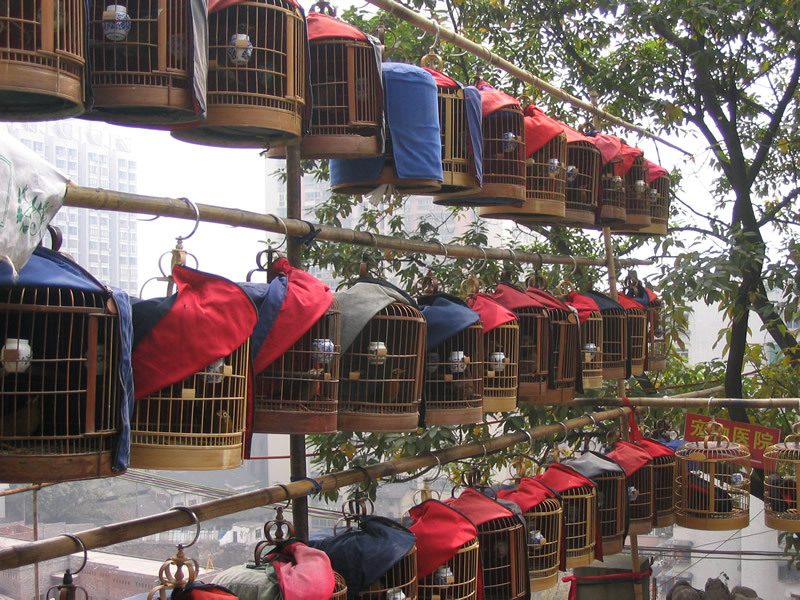 Ideally you will be able to say a few words in Chinese when you go to China. In any event you will need a good phrasebook. Here you can download a phrasebook in electronic form (e-book) which will give you some basic idea about survival Chinese, however you will have to have a hard-copy of the phrasebook, either this one or another one that you like. This file is hosted at rapidshare.com. The complexity and novelty of the Chinese writing system (Chinese characters) can be overwhelming and intimidating to the westerners who are not trained in Chinese language. I don’t know of any other book which would be a better introduction to the Chinese characters than this book called “Fun with Chinese Characters”. In this book hundreds of frequently used characters are described and explained in a way that actually they make sense. This book is hosted at rapidshare.com. “My Country and My People” is written by Lin Yutang and published in 1938, it’s out of print now which is a pity because I think this is an invaluable study material for those who want to understand Chinese way of life. Lin Yutang was someone who lived in western countries most of his life however being Chinese and someone who grew up in China his insights and understanding of Chinese culture are precious because he makes frequent comparisons between Chinese and western ways. In order to read this book you will need a small program (it’s free) called “WinDjView” because this file is a .djvu file. You may not have heard of this file format but as far as I know this is the only file format that allows such a good compression of graphic files; this book has almost 400 pages, which is 204 pictures packed into 12Mb!). If you want to read this book in your browser you can download the .djvu plug-in from this web site. There are very few man-made structures in the world that make such an awe-inspiring impression such as the Great Wall of China. I used the pictures I took when I visited the great Wall in 2005 (Jin Shan Ling section of the Great Wall) and made this screen-saver for you. I also uploaded the original 360 degree panoramic view of the Great Wall as a JPG file. You can download either one. If you decide to visit the Great Wall yourself I suggest you go 3-4 hours towards the north from Beijing where is Jin Shan Ling section of the Great Wall. From there you can walk on the wall for 4-5 hours until you reach Si Ma Tai section of the Great Wall which is much more demanding for an average hiker. 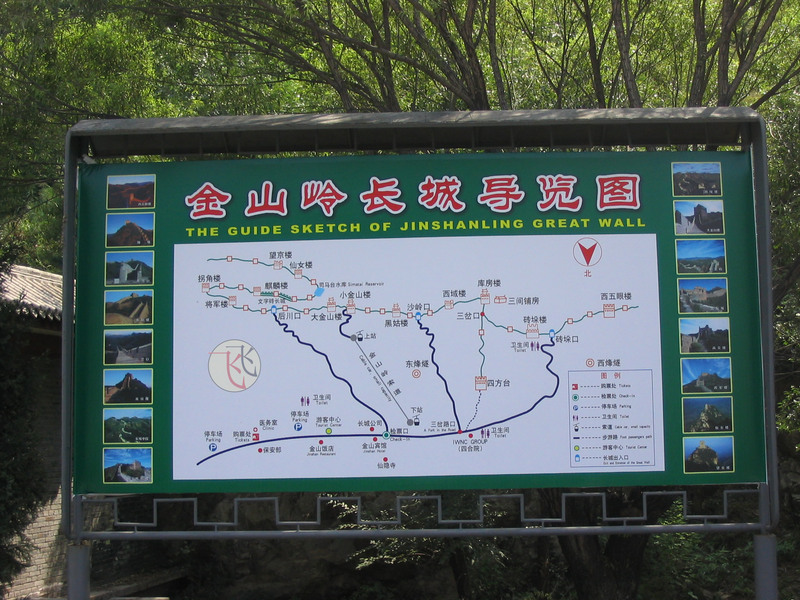 Here is the tourist map of the Jin Shan Ling section of the Great Wall of China. Taishan is the number one mountain among the Chinese sacred mountains; revered both by Emperors and ordinary folks (not only those who consider themselves the Daoist but rather all those who consider themselves truly Chinese). It is the destination point for a steady stream of mostly Chinese tourists/pilgrims heading towards the top of the mountain. Some of them come early in the day to see the beautiful scenery, some later in the evening so that they can see the sunrise from the summit. It is believed that if you climb Taishan you will live a long life (at least 100). 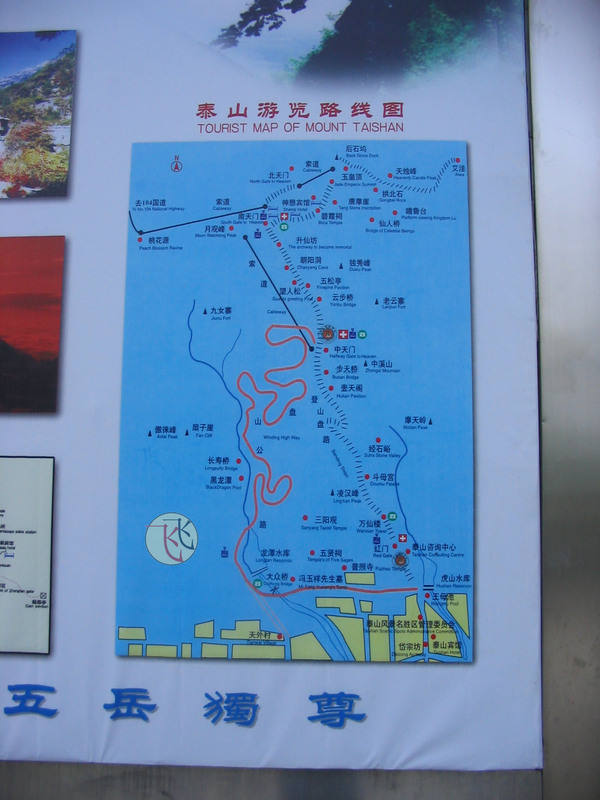 Here you can download the map of Taishan Mountaun. If you wish to visit Taishan the best plan is to fly to Beijing and then take an overnight train to Taian City, stay on the mountain one night and return the following day. 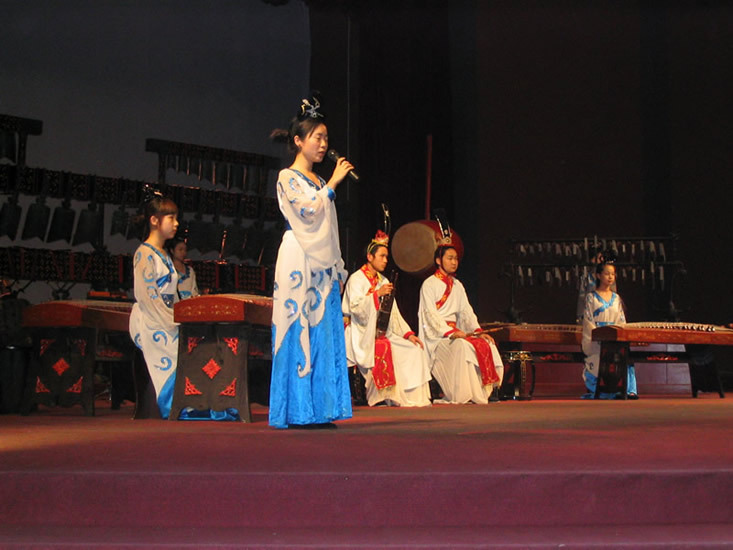 “The Moon Represents my Heart” by Deng Li Jun has been one of the most beloved songs in China. So if you end up singing a Chinese song at a karaoke bar in China and you want to impress the Chinese then you may wish to learn this song :) The three icons above are links to the song itself, the lyrics and the score. Enjoy! 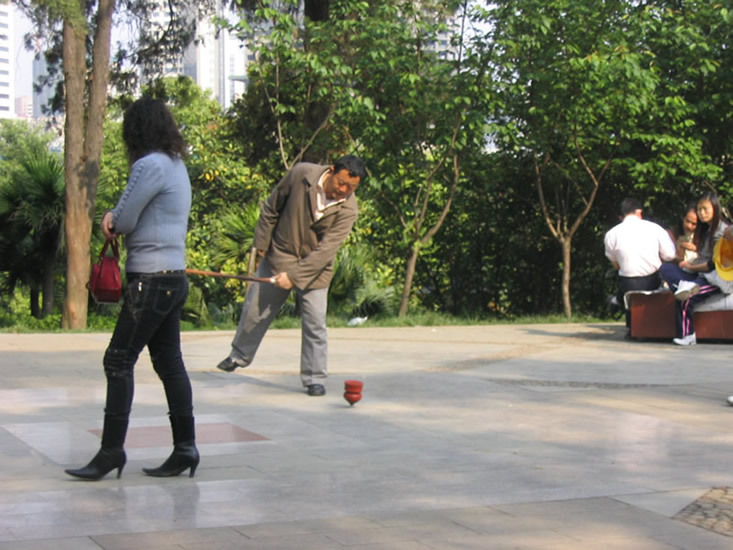 The Chinese like early morning exercises in the city parks, but they also do other things in the parks too; they bring cages with their birds (, they get together and play traditional Chinese instruments or sing Peking Opera songs (the high-pitched arias of the Peking Opera may sound as a violent assault in progress to an untrained ear). 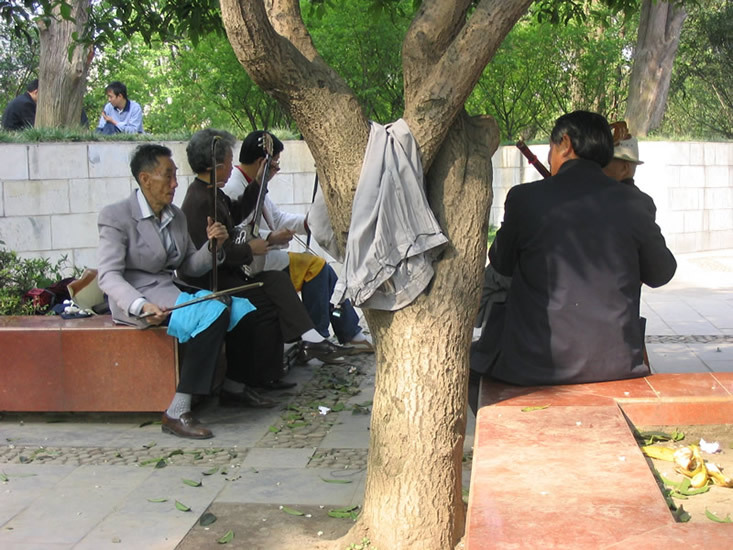 When I was in Guiyang in April of 2007 I recorded these amateur musicians performing in the park. I used Olimpus Digital Voice Recorder (VN 240) to record their music. There are two files with their music. The snapping sound in the background was coming from another gentleman who was playing a whipping top nearby. 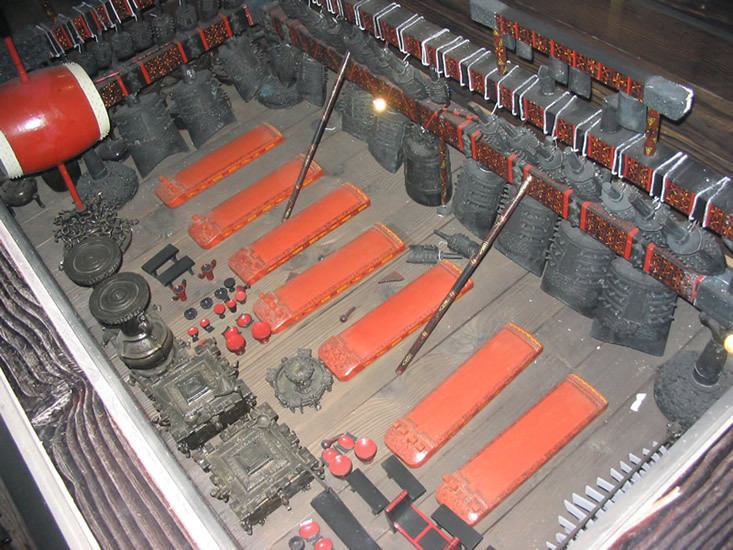 Hubei Provincial Museum in Wuhan is the home to over 7 000 precious archeological artifacts coming mostly from a 2400-year-old tomb (Tomb of the Marquis of Yi of Zeng State, the Warring States Period, 475-221 BC). 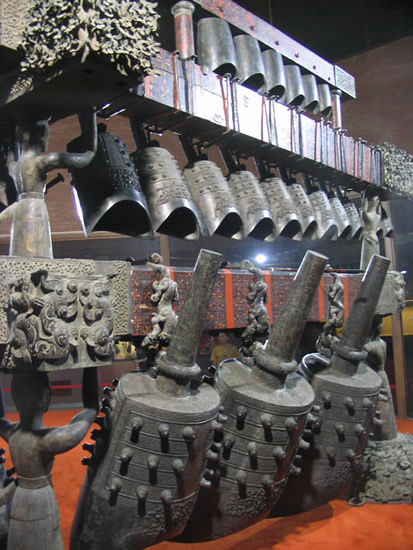 Many musical instruments were amongst the finds including the 64 dynastic bronze bells which are among the oldest in China. The bells are played with hand-held rods and each bell can produce two tones depending on where it is struck. It took modern scientists 5 years to figure it out and make exact replicas. 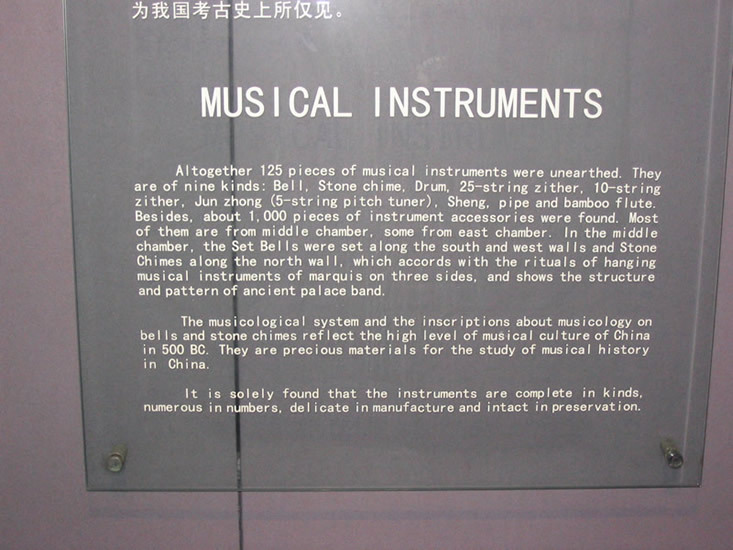 There are more than one hundred other musical instruments on display at the museum. For additional Y20-Y30 you can enjoy a brief performance in the museum’s auditorium every a couple of hours when several tunes are played using those ancient instruments including the bells (their replicas, of course). I recorded all of them using just a simple voice recorder (Olimpus Digital Voice Recorder (VN 240)). Take a listen!